Looking for something rewarding to get involved with in Phnom Penh? If so then we recommend CHOICE Cambodia. It is a Non-Profit organization (NPO), founded by expatriates in 2006. The team all volunteers and living in Phnom Penh strive to make a difference to the extremely poor and disadvantaged people of Cambodia. They classify the extreme poor as those Khmers who are homeless, isolated or villagers who have no land, jobs and no adequate healthcare, they do not have the resources to provide for themselves. Support them by donating and/or volunteering to make a change to their lives. Visit their website to find out more. 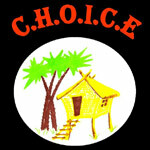 The CHOICE team meet up most week days at 4.30pm at LongLin guesthouse at #159, Street 19, near St 172. Its similar to Sky Bar in that its a great place to meet new people and hang out and some of our customers go there also.